The Republican Chairman of the House Intelligence Committee appears to admit to Fox News that a White House staffer is under surveillance. 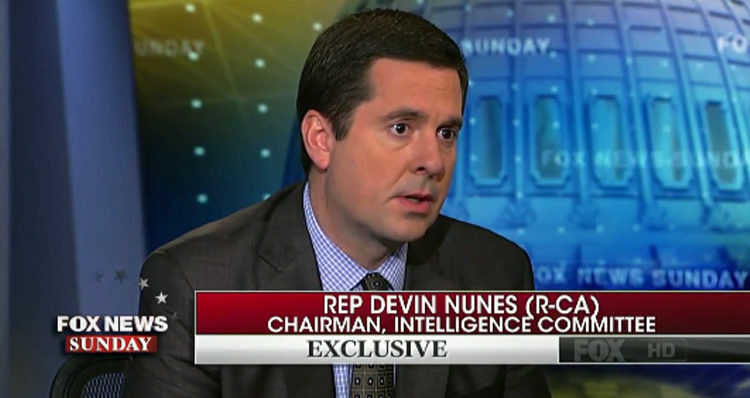 House Intelligence Committee Chairman Rep. Devin Nunes (R-CA) sat down with Fox News host Chris Wallace on Sunday to discuss his committee’s investigation of possible Russian influence on the 2016 presidential election and Trump’s recent wiretapping claims. “No, there was no FISA warrant that I’m aware of to tap Trump Tower,” Nunes told Wallace, adding that they would – however – be investigating events surrounding the unmasking of Trump’s former National Security Adviser Gen. Mike Flynn and his interactions with the Russian ambassador. “We know a law has been broken and we need to get to the bottom of it,” Nunes said, adding that he has not seen any evidence so far of any collusion with the Trump campaign and Russia. CHRIS WALLACE: Do we think there was any surveillance of people in Trump World, or do we think that there was surveillance of other people like Ambassador Kislyak and that these folks who were talking to them were incidentally swept up in the conversations, in the intercepts? DEVIN NUNES: Well, if you look at the folks that are working at the White House today, that are involved in the Trump administration, I don’t think there’s any but one there that is under any type of investigation or surveillance activities at all. Disclaimer: Chris Wallace did not seem to catch the admission – possibly thinking that Nunes was referring to Flynn although he clearly specified he was talking about “folks that are working at the White House today.” In the absence of any follow-up by Wallace and any other corroboration of the statement by Nunes it would be inaccurate to simply take his comments at face value. You can listen to the interview and judge for yourself. The relevant portion begins at 5 minutes and 14 seconds.